So we reviewed the French version of Schweppes’ European tonic waters not too long ago. The difference between the two is wide: night and day. The French version uses a glucose-fructose syrup. The British version uses sugar. The British version has 150mL with a scant 22 calories. The French version boasts 54 calories for the same amount. And yet, despite being much less sweet, this version of Schweppes Indian Tonic doesn’t taste that much less sweet. It has some similar qualities: first, the quinine predominates. A fair amount of bitterness. But it doesn’t quite clean the palette in the same way that Q tonic does. Its a bit more acidic in quality, a bit more “dry.” The sweetness comes through even less in a Gin and Tonic, leaving lots of room for lemon or lime. When making cocktails with it, I even doubled up the lemon or lime to compliment the drink and round out the flavor. While I think its an excellent tonic that I wouldn’t be hesitant to recommend to a fan of gin, I can’t see it being too popular with those in search of something “sweet,” or to those who are big fans of supermarket tonics in the state. Recommended, and quite excellent, albeit probably not for everyone. Best consumed: Works well with most fins, but I’d suggest adding lemon or lime to compliment the quinine. Availability:UK and Europe, perhaps an import specialty grocery in the states if you keep your eyes open. Rating: For people who like a more bitter tonic but with a bit more sweetness than Q. Its on the bitter side of the spectrum, but not all the way over. Its more bitter than the French version, and less than Q. Overall, recommended. Schweppes is available from Amazon.co.uk in the UK. It’s interesting to see other people’s perspectives on Schweppes Tonic Water. I’ve never tried the US version but I had some European Schweppes (from Spain) on holiday recently and much preferred it to the UK version. I need to do a side-by-side tasting of the two (I bought a can back with me) to get a better handle on the differences. I don’t like the taste of artificial sweeteners an their presence really ruins the UK Schweppes for me; it gives it a really nasty chemical twang. I have been accumulating tonics recently with a view of doing a mass comparison of different types – which should be fun. Interesting, I’ve been doing reviews of Tonic Waters for a while and these European ones are rather new to me. Most Americans ones have artificial sweeteners, so for me, a tonic which uses artificial sweeteners but in moderation is a far cry from what is normally available here. There are of course US made exceptions, you have your Q Tonic, your organic store generic brand with real sugar. I’m curious, is the Spanish one similar to the French version [using real sugar?] or do they differ on a nation top nation basis? Looking forward to hearing more of your mass comparison of different types! I’m not sure if the French one differs from the Spanish one; the sweetener used in the UK can’t be used in France (at least that is my understanding). I have a bottle of Russian Schweppes so will be interested to see how that compares. Aaron, on balance UK vs. EU which did you prefer? Slight preference for the EU one. But I vastly prefer both to the US one. 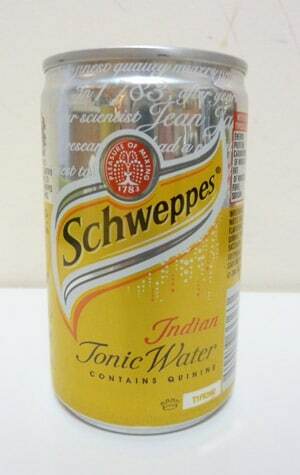 Just wondered if anyone else in Britain has noticed that, since its re-brand, Schweppes Indian Tonic Water (not the Slimline version, which I never drink) tastes completely different and, frankly, pretty revolting?! Having read your review here, I’m wondering if they’ve phased out the British version and replaced it with the sickly sweet French version. Have contacted Scweppes to ask what they’ve done and is there any way I can find the old version, and they told me the formula hasn’t changed, but I’m afraid my (and my friends’) taste-buds don’t lie. Really sad because I’m now struggling to find a tonic that I can enjoy my gin with – it really has transformed the taste and ruined my long-established pleasure in a G&T. Any thoughts? Schleppers ITW in the UK used to have sugar and no sweetener. Now it has Sugar ans a false sweetener. Very disappointing !! Thank you, thank you, W Matthews. I have been noticing a sudden change in the taste of Schweppes Indian Tonic Water, and I agree that the change is not a good one. It has resulted in the end of my customary looking forward to a G&T at the beginning of the evening. After many years of enjoying what I thought of as “The Panacea”, I find I now have to embark upon a voyage of discovery to find a tonic water that will recreate the bliss to which I was introduced by a favourite uncle when I was 16 years old. There are many, many gins that deserve so much more than Schweppes (or Canada Dry) are offering. Great, great gins include (but are not limited to) Blade, North Shore, Victoria, and St. George’s Botanivore. Fully agree with comments already made, I can now no longer drink what was my favourite tonic water. I am looking for a replacement that is NOT sweet. Can we please have our old tonic water back ? I haven’t drunk G&T for something like 10 years and found the one I tried last might much too sweet for me, in Australia. I do have some of the previous Schwepps ITW somewhere, can’t find it currently.